Positive mindset promoter and interior stylist, Victoria is the creative mind behind award winning interiors blog Apartment Number 4 – an online destination that inspires people to ‘create a warm, inviting and stylish place to live’ but without breaking the bank. Having spent a few hours (she loved it so much) having fun and experimenting with different room sets and products, Victoria was impressed with the choice of interior styles, as well as the different options for altering décor, such as changing wall colours. A longstanding admirer of loft style living, Victoria was drawn to our loft apartment setting, styling it effortlessly with our gorgeous Glint Black vertical blinds that tie the room scheme together beautifully, making a real style statement. Victoria was also ‘surprised’ to find five stockists in her local area – proving how readily available our products are via retailers nationwide – so why not search for suppliers in your area now? Read Victoria’s full DesignSpace review here. 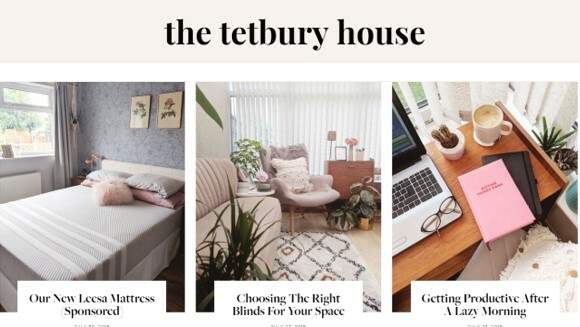 Our second reviewer was Catherine, interiors-obsessed blogger for The Tetbury House, who described her own frustrating and ‘nerve-wracking’ experiences of investing in window blinds without being able to visualise them first. Catherine highlighted how useful (and financially prudent) it is to properly view how blinds will look at the windows ahead of taking the plunge and ordering them. She was also very complimentary about our free sample service – it allows you to order up to five free fabric samples, so you can see and feel the fabric ahead of making a purchase. Read the full Tetbury House DesignSpace review here. And why not try out DesignSpace for yourself – we’d love to hear your thoughts via Facebook or Twitter.